Today we are talking about the women leading fashion bradn Ittehand season end winter sale collection 2019. 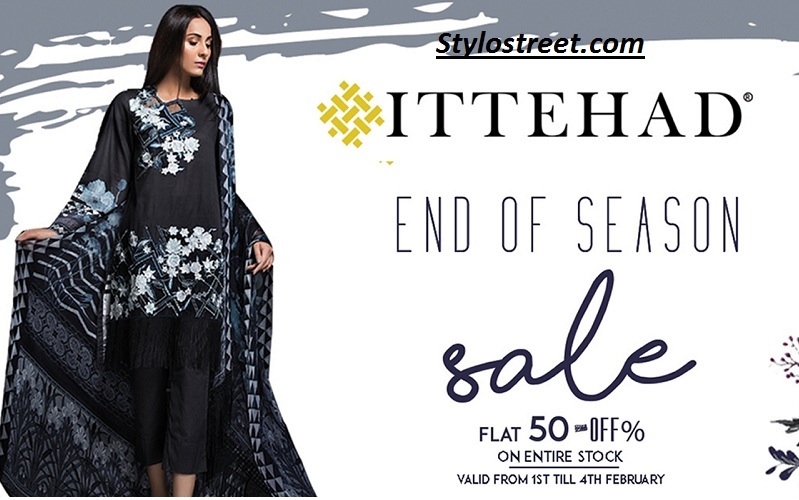 Ittehad Sale 2019 providing flat 50% off on all products till 4th of February 2019. The season end sale is valid to instore and online. Click on the given link below to locate winter sale Ittehad sale 2019. Starting from 1st of February 2019 to Monday 4th February 2019. As we all love to select beautiful winter dresses for the leading fashion designer collection House of Ittehad 2019. Furthermore, as we know that the winter season is coming with the latest trendy winter sale collection 2019. Now, the house of ittehad winter sale 2019 is going to show another heart touching arrival for women. Now, Pakistani women get easily winter seasonal wear collection at the sale price. There are many fashion designers in Pakistan who are working sincerely and hard to get success at the international level.